Rubicon express is a heavy hitter in the Jeep lift kit business. They make good kits that are complete, and don’t come in garish colors. 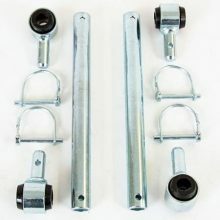 The Rubicon Express RE5515 4 inch lift kit for your 1987-1995 Jeep Wrangler YJ is no different. It comes with new leaf springs, new U bolts, swaybar disconnects and more. The RE515 has everything you need to run tires up to 33×12.5. 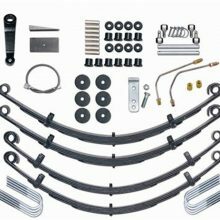 You can buy the Rubicon Express 4″ YJ Lift Kit with or without shocks (there is slightly more than $100 difference between shocks and no shocks). I’m a fan of this kit. It has everything you need to run 33s on your YJ. 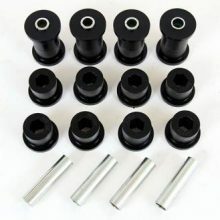 This kit has things that I haven’t seen in other kits, like brake line extension, and disconnectable swaybar links. These are the things that I would normally have to buy after the fact. 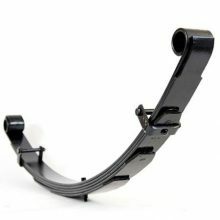 The only thing that you may want to look out for is the rear axle shims. If you’re going to run a slip yoke eliminator and CV driveshaft, then you’ll be fine, but if you’re stock, then you may need to address the angle. Stock drivelines will often need the 6 or 8 degree shims, however this is something you likely won’t know until you get the lift in. Luckily, it’s pretty easy to get the guys from Rubicon Express on the phone, and they have walked me through problems in the past. The only complaint that I’ve seen about this kit is that it can ride rough until it’s broken in. The break-in process can actually take several hundred miles.